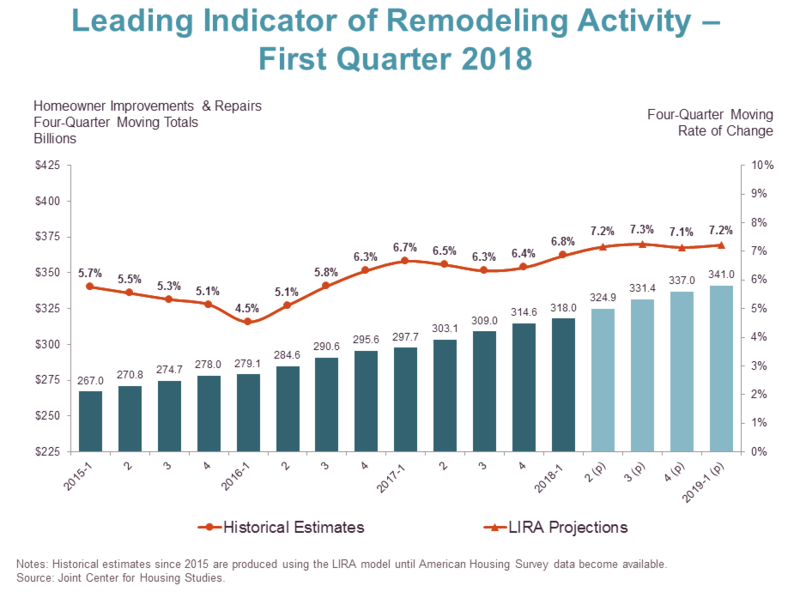 Remodelers should expect spending on home improvement projects and repairs to increase this year at a rate not seen since before the downturn, according to the latest Leading Indicator of Remodeling Activity (LIRA) from Harvard University’s Joint Center for Housing Studies. 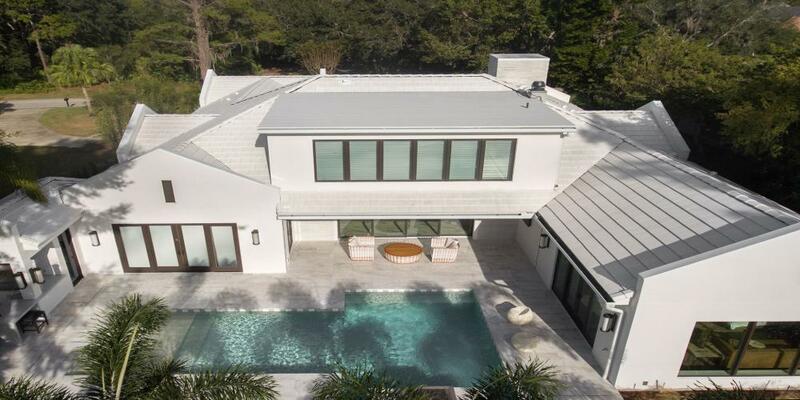 Last year was a gangbusters year for remodelers––spending grew at an annual rate above 6 percent, which amounted to a yearly spending increase of more than $15 billion. If the 2018 projection proves accurate, that rate will rise to above 7 percent, the highest rate since Q1 2007 (when the rate of growth was 11.1 percent), with a spending increase of $23 billion. That being said, despite long-term accuracy not being a primary aim of the indicator, it is fairly accurate nonetheless. That’s particularly true as it pertains to the improvements side of the market. Illustrated in the below graph are past JCHS improvement-spending projections as well as the actual expenditures as recorded by the AHS. 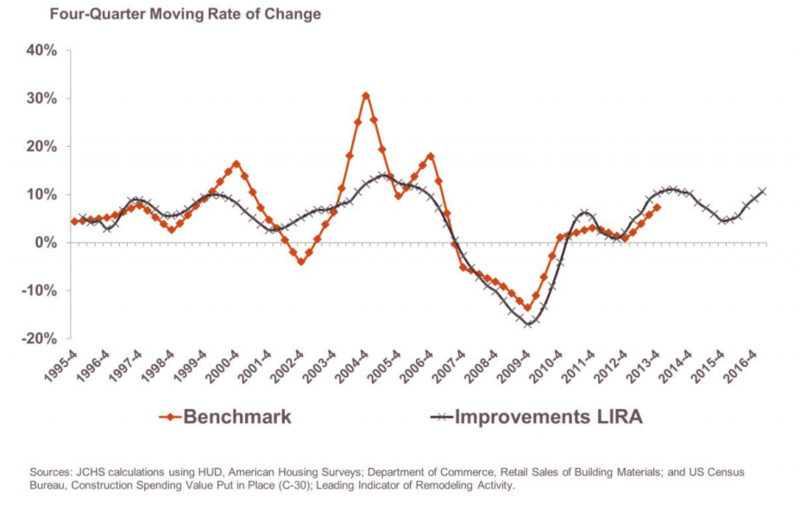 The two datasets (i.e., AHS benchmarks and LIRA-projected improvement spending) run along similar tracks. In stats talk, they’re correlated, and strongly. To give you some reference, correlation is measured on a scale of -1 to 1, with the negative being the strongest possible disagreement between two datasets, and the positive being the exact opposite. Over 20 years, LIRA projections on improvement have managed a correlation coefficient of 0.85. 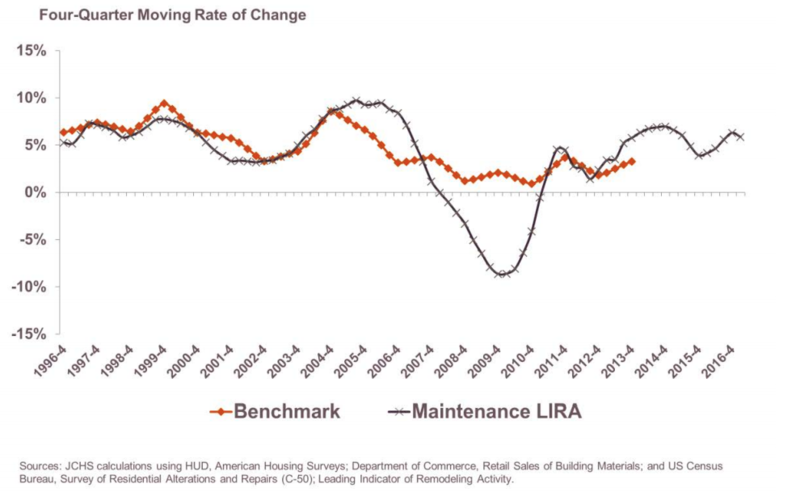 There is less accuracy in JCHS’ maintenance, or repair, spending projections (shown above), and for simple reason: that side of the market is more volatile. “It was especially more volatile during the bust years,” Will says. Still, the correlation coefficient was 0.76, which indicates a pretty strong alignment. “Ultimately, the LIRA does a good job tracking upturns and downturns in spending,” Will says, explaining that the figures balance out to a pretty dependable medium-term indicator. 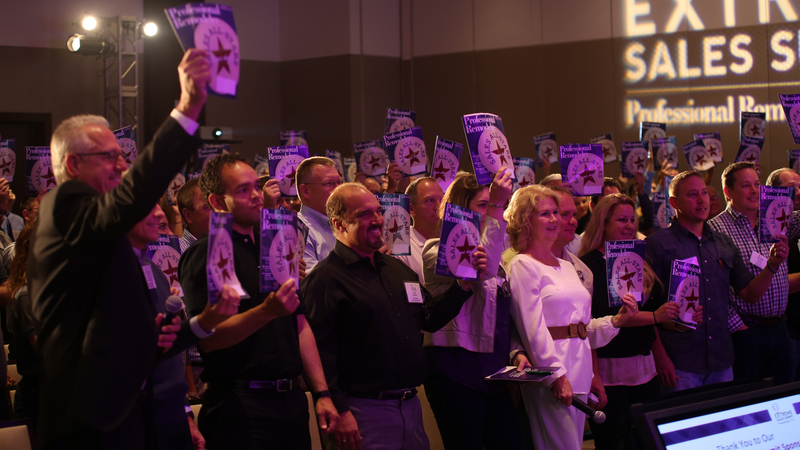 If you’re looking for additional reports to corroborate at least the impression that remodelers are poised for a year of heavy demand, finding them will not be much trouble. Multiple outlets citing numerous sources have reported spending and confidence increases. In fact, just recently, the National Association of Homebuilders released its latest Remodeling Market Index, which showed a strong, continued confidence in both current and future market conditions.